The downward trend in prices might continue as demand is unlikely to recover in May. Moreover, increased production has also put pressure on prices of commodities. The forecast of a normal monsoon, weak demand and rising supply of agri commodities, following a good crop, have led to a fall in prices of the produce. Prices of agri commodities such as wheat, chilli, turmeric and pulses, among others, have been on the wane since the past few weeks. Wheat arrivals have risen sharply. The Food Corporation of India has recorded huge procurement in some parts of North India. In Delhi, the market price fell 3.5 per cent. Oilseed prices, too, have fallen due to better crop. Further slide in global prices has added to the pressure. According to agriculture experts and traders, the downward trend in prices might continue as demand is unlikely to recover in May. Moreover, increased production has also put pressure on prices of commodities. Wheat prices have slid below the minimum support price in Uttar Pradesh (UP) to Rs 1,500-1,550 a quintal from Rs 1,625 a quintal earlier. In the past two weeks, prices have declined Rs 50-70 a quintal. UP-based wheat trader Rajiv Gupta said prices might fall further as demand from industries was weak. Soybean prices, too, have dropped due to higher arrivals and subdued demand for soymeal in local markets. All-India soybean arrivals stood at 150,000-155,000 bags (90 kilos a bag), against 65,00-70,000 bags earlier. Coriander prices hit a 15-month after hitting the lower circuit on concerns of rising supplies from imports and good production expectations from the 2016-17 new crop season. Market participants are also concerned about increasing coriander imports, supported by a depreciating rupee. Turmeric prices have fallen from Rs 6,173 a quintal to Rs 5,650 a quintal in the past one month. Turmeric prices fell amid sufficient stocks in the spot markets, following a pick-up in arrivals. Similarly, jeera prices declined, on the back of lower domestic and export demand at spot market. “Arrival of new crops of spices and weak domestic as well as international demand has pulled down the prices, and this may continue in the short run. The same trend has been seen in oilseeds as well. 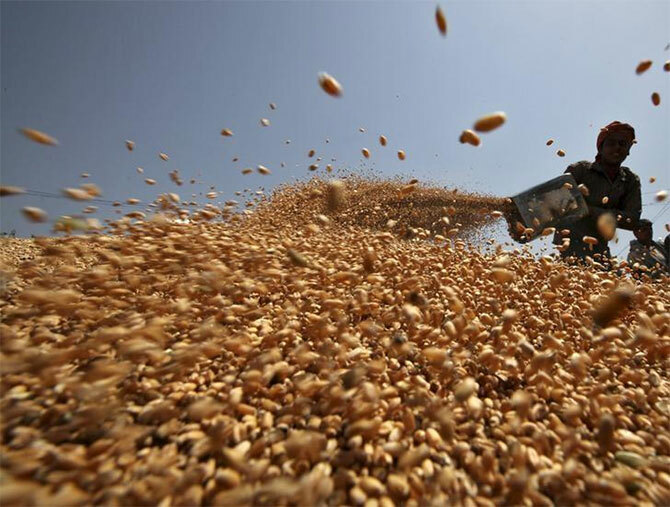 Overall weak demand has affected commodities prices,” said Kedia. Not just production, significant imports have also led to a glut in the market, experts said. B K Sabarwal, past president of the Commodity Participants Association of India, said prices were artificially inflated in the fourth quarter of 2016-17 but this trend could not sustain.